My inspiration for the Asymmetrical Angles Scarf was a scarf I designed for the Opera Art Project with the Edmonton Opera (www.edmontonopera.com) and the Alberta Craft Council Gallery (www.albertacraft.ab.ca). It was based on the Les Contes d’Hoffman Opera, a Victorian Steampunk inspired opera. You can soften the look by changing the colours of the yarns to ivory or a pastel colour or strengthen the Steampunk essence by using black, greys, sepia tones or red. Make them in a cool cotton for the warmer days and add the warmth of merino wool or other fibres in cooler days. I hope you enjoy knitting this design. Available on my Etsy store at https://www.etsy.com/ca/listing/183837111/knitting-pattern-asymmetrical-angles? The Asymmetrical Angles Scarf pattern has an eclectic feel to the design with a Victorian Steampunk Essence in the Asymmetry. It was popular in this era to add found objects to your clothing as shown in the various clasps I used to accent the scarf. Add 3 clasps to strengthen the look. 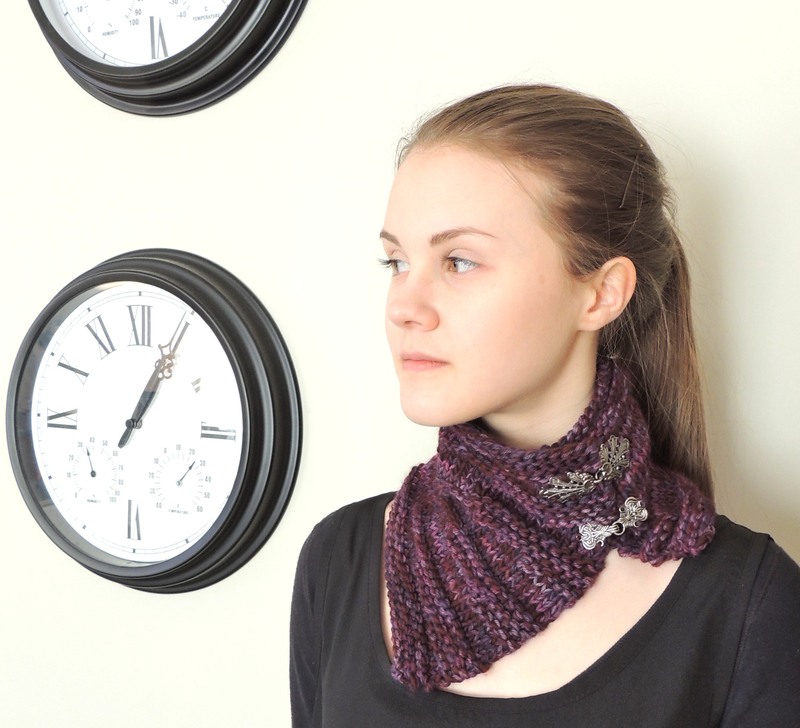 The Asymmetrical Angles Scarf Knitting Pattern can be worn with the clasps at the front or to the side for a slightly different look and warmth. I used a 2 strand method to knit this scarf with 2 different worsted weight yarns. (Malabrigo Worsted Merino and Malabrigo Rios hand painted merino wool). You can use most worsted weight yarns including cotton and other fibres. I am continuing to pattern various designs of my previous work and new designs that will include crochet patterns down the road. Be sure to come back soon to see the latest. I am also working on new pieces of my finished accessories for Fall. Hard to believe when Spring hasn’t technically come here yet. The morning began with -13. Not very Spring like and I am looking forward to the warmer days ahead. Hi Valerie…I bought your angles scarf today. Question: on the short rows, do we need to wrap and turn so there aren’t holes? Anxious to try making this one soon! Glad you are selling patterns! Thank you for purchasing my pattern so fast! 🙂 When I have knit short rows with other yarns you sometimes need to wrap and turn to avoid a hole. With these two yarns together it wasn’t necessary. I would try a sample of a few rows with the yarn you are going to use to see if you need to or not. Mine turned out great without the wrap. Let me know how yours goes and which yarns you used. Would love to see a picture after too! Enjoy! Love this scarf! Really like asymmetrical designs. Gorgeous!